Made of flexible plastic with a cutout designed to promote drinking without neck extension. Unlike other cut cups, our Pink and Blue cups can be gently "squeezed" to change the shape of the cup lip. You can see the liquid through the translucent plastic. 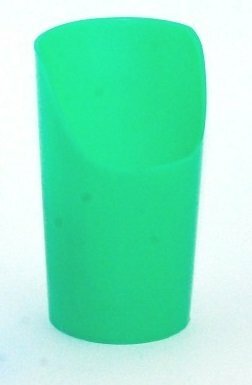 Green cup is designed for independent use and is stiffer. Top rack dishwasher-safe. No heated drying. Available in three sizes. Provides calming benefits for a sensory diet. If you have any questions about this product by Shop Equipment, contact us by completing and submitting the form below. If you are looking for a specif part number, please include it with your message.